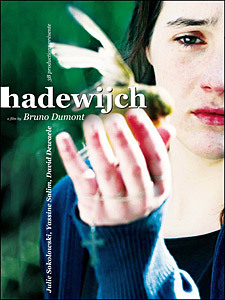 Hadewijch (Director: Bruno Dumont): In this, his fifth feature film, Bruno Dumont has created something as mysterious and beautiful as his protagonist. We meet young Celine in a convent, where she is hoping to take her vows as a nun. But her refusal to eat and other acts of self-denial worry the Mother Superior, who turns her out into the world, hoping to rid her of what she considers “self-love.” Though she lives with her wealthy parents in the centre of Paris, they’re distant and there’s some suggestion of buried issues with her father. One day she meets some boys in a café, who are amazed at her trusting nature. Yassine takes a special liking to her, although she rebuffs his romantic advances, claiming she only has love for Christ. The young Muslim is befuddled but still besotted, so he continues their friendship. Eventually she visits the home he shares with his brother Nassir in the housing projects outside the city. Nassir is a “serious” Muslim, according to Yassine, and he thinks they’ll hit it off. He has no idea. Nassir recognizes the fire that burns in Celine’s heart, and though their religions are different, their passion is the same. Over time, he convinces Celine that God is not only about love, but about justice as well. Soon after that, he takes her to Lebanon to show her the injustice he finds there. Dumont patiently lays the groundwork for a stunning climax that shows just how easily love can turn to violence. Meanwhile, in a parallel plot, we follow David, a petty criminal working in construction at the convent. He breaks his parole and is sent back to jail for a few months. It’s not clear what his purpose is until the final scene, in which the two lives stand in stark contrast to each other. Celine lives in extremes, reaching for holiness and finding tragedy. David is an everyman, flawed but more capable of love than Celine could ever be. The intersection of their lives leads to a powerfully moving ending. Dumont put his faith in non-professional Julie Sokolowski to play Celine, and the decision pays off. She portrays her disconnection from the world naturally, even as she radiates a forbidden sexuality. Her purity attracts men, but she only has eyes for Christ, and her obsession verges on the sexual. Her prayers are painful, expressing her yearning to be with Christ even as she protests his absence. She longs for the ecstasy and oblivion of union with God, and the connection with some of the rhetoric of Islamic terrorism couldn’t be more clear. This is the first of Dumont’s films I’ve seen, and I’m captivated by his intelligence and willingness to explore such interior issues as religious faith and obsession. In the post-screening Q&A, he revealed that Hadewijch was a real mystic from the Middle Ages, and his exploration of what a modern example would look like in a world filled with political action makes for one smart and haunting film. This entry was posted in Film Festivals, TIFF and tagged #tiff09, christianity, faith, france, fundamentalism, islam, religion. Bookmark the permalink. Many thanks for your sensitive and informative review, and for providing the Q&A audio. Could the film’s depiction of Islamic piety have anything to do with its not having been selected for this year’s Cannes? Thank you for your comment, Rob. I was speaking with a (non-religious) Muslim friend today and he found the film offensive. I argued that I thought Dumont was trying to show that any religious fervor can be turned to violent ends, but he thought that the Muslim characters had been “used”. Interesting discussion. Thanks a lot for providing the Q&A audio. Can you say what was the general feeling about the film after the screening? Did people only think about its religious meaning? Difficult to say, Remy. I think someone in the Q&A made a comment that they thought she was suffering from a mental illness, but some people say that about almost anyone who doesn’t subscribe to a completely materialistic world view these days. I wish there had been comments about the Muslim issue. I expect there will be in the French press! I have to say that Dumont wasnt interested to think about the islam. The muslims were treated like the Others, from an external point of view. Maybe he should have gone deeply in the matter but he didnt. This reveals to us the general status of the islam in our world. The character of Nassir wasnt a simple terrorist alquaida style. He was also an intellectual engaged in politic. We can notice that the war in his country is related to his will of putting the bomb. dont you think? An insightful review of a compelling and powerful film. Your 9/10 rating is apropos. One could hear a pin drop at the repeat TIFF screening at the Winter Garden on Saturday. HADEWIJCH is one of those films that resonates days later. Beautifully-made, haunting indeed, a truly thought provoking experience in many ways. Controversial? Yes. That’s what makes for powerful cinema. I have to say that Lebanon is not the country in the story because in lebanon we find only red cross.